Southern Companyannounced today that it is raising its dividend for the 12th straight year. Effective June 6 for shareholders of record as of May 6, the utility's annual dividend will increase 3.6% to $2.03 per share. 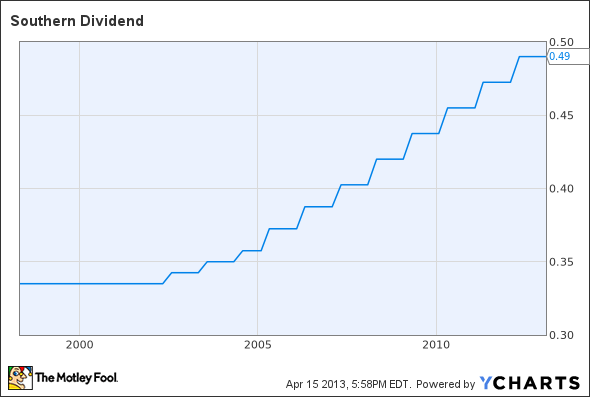 Source: SO Dividend data by YCharts. At its current share price of $47.36, this represents a 0.2 percentage point dividend yield increase to 4.3%. 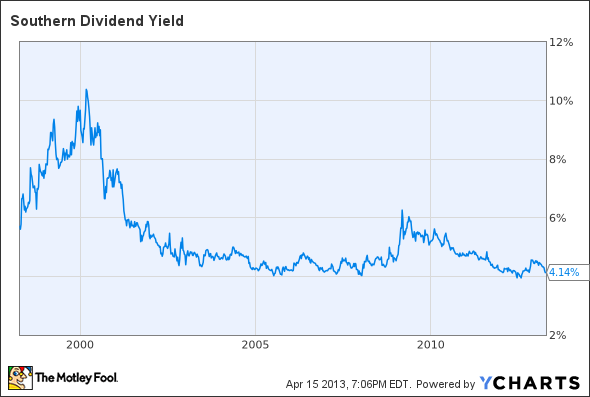 Source: SO Dividend Yield data by YCharts. "For more than 100 years, Southern Company has provided consistent value for customers and shareholders alike," said Chairman, President, and CEO Thomas Fanning in a statement today. "Our long history of providing clean, safe, reliable and affordable electricity-combined with our industry-leading financial integrity and commitment to providing solutions through innovation-leaves us well-positioned to meet the energy and business challenges of the future." According to Southern, this upcoming quarter will be the 262nd consecutive quarter that the utility has distributed a dividend to shareholders. The article Southern Company Raises Dividend for 12th Straight Year originally appeared on Fool.com. Fool contributor Justin Loiseau has no position in any stocks mentioned, but he does use electricity. You can follow him on Twitter @TMFJLo and on Motley Fool CAPS @TMFJLo.The Motley Fool recommends Southern Company. Try any of our Foolish newsletter services free for 30 days. We Fools may not all hold the same opinions, but we all believe that considering a diverse range of insights makes us better investors. The Motley Fool has a disclosure policy.